VERY FINE APPEARANCE. A RARE EXAMPLE OF THE ONE-CENT 1851 ISSUE WITH CHICAGO PERFORATIONS. APPROXIMATELY 19 EXAMPLES ARE RECORDED. THIS IS ARGUABLY ONE OF THE FINEST SINGLES EXTANT. The origin of the Chicago perforation was revealed in an article published by Jerome S. Wagshal in Chronicle 130 (May 1986). To briefly summarize Mr. Wagshal's revelations, the inventor of the machine used to create the Chicago Perf stamps was Dr. Elijah W. Hadley, a Chicago dentist. He probably constructed the machine in 1854. Over a two-year period, beginning in November 1854, Dr. Hadley's device was offered for sale to the Post Office Department thru R. K. Swift, a prominent Chicago banker and businessman. The distinctive 12-1/2 gauge Chicago Perf was applied to sheets of the 1c (Plates 1 Late and 2) and 3c 1851 Issue, the former being considerably rarer. According to the census of Chicago Perf items compiled by W. Wilson Hulme II (Chronicle 175, Aug. 1997), a total of 19 examples of the 1c Chicago Perf have been recorded, comprising 2 unused, 5 used on covers and 12 used off cover (including a strip of three). FINE APPEARANCE. ONE OF 33 RECORDED EXAMPLES FROM THE "SAMPLE A" SHEET WITH THE HADLEY 11-GAUGE CHICAGO PERFORATIONS. 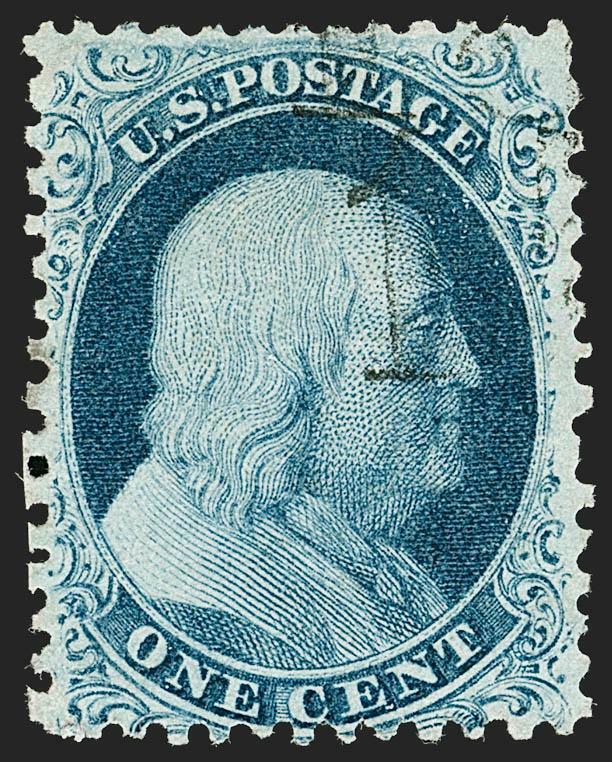 This stamp is from the top right position of the Chase block of 21 pictured in his book on p. 176. A total of 33 "Sample A" Chicago Perf stamps are recorded, including a block of nine, two blocks of six and a block of four. There are four contiguous stamps from the Chase piece that have not been accounted for and may or may not still exist as a block. 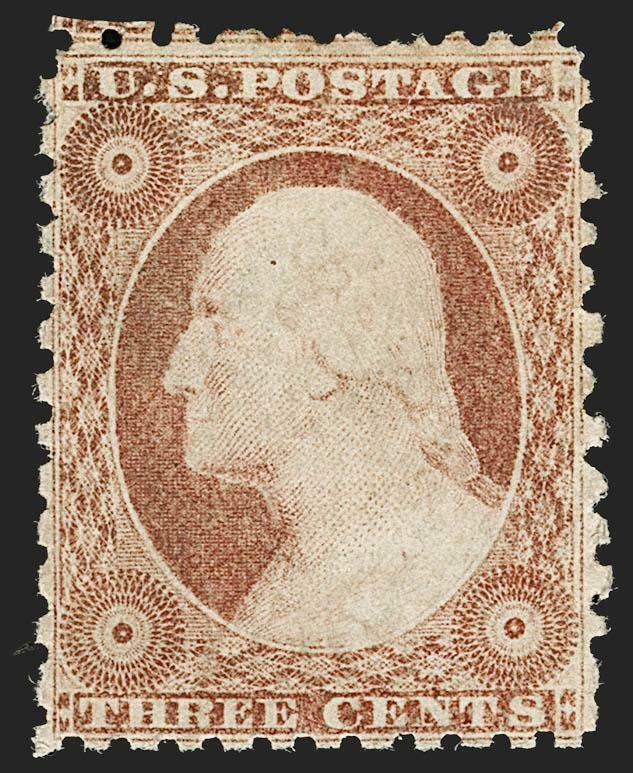 The examples from the Sample "A" sheet are the only known unused 3c stamps with Chicago perforations. There are no known unused examples with the gauge 12.5 perforations.